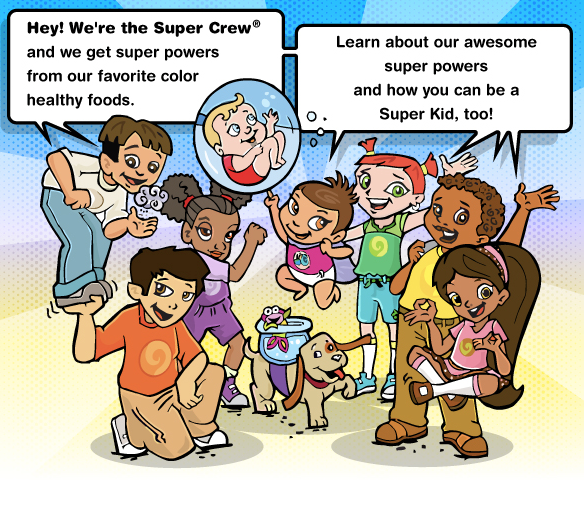 Meet the Super Crew®, a cast of superhero kids who get special powers from eating healthy, colorful foods. 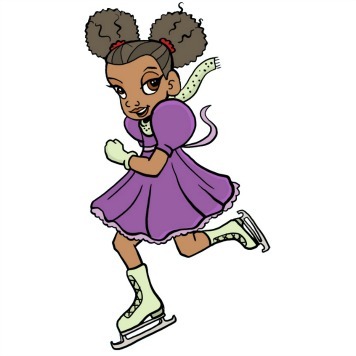 These focus group tested and approved characters make learning about good food and fitness fun and engaging. The Super Crew is featured on activities on over 5,000 school websites in 40 states. Along with schools, you can find the Super Crew in cooking, fitness and fun activities in SuperKids Nutrition and the American Institute of Cancer Research, Healthy Kids Today, Prevent Cancer Tomorrow Initiative. Most recently the Super Crew appear as activity place mats and toy incentives for choosing healthy meals at select restaurants through Healthy Dining Finder’s, Kids LiveWell program which is funded through a Center for Disease Control grant. 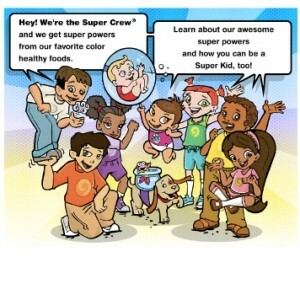 Visit the Super Crew website for kids! 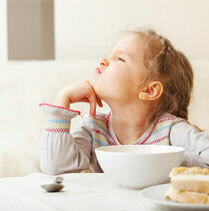 Visit our fun Super Crew activities and curriculum for home or school. Read our Super Crew books, Super Baby Abigail’s Lunch Time Adventure and Havoc at the Hillside Market. Have fun coloring or water-coloring our Super Crew coloring pages. Seven Dinners, Five People, Under $60! !